Just what is a skid house? And why would you want to move one? 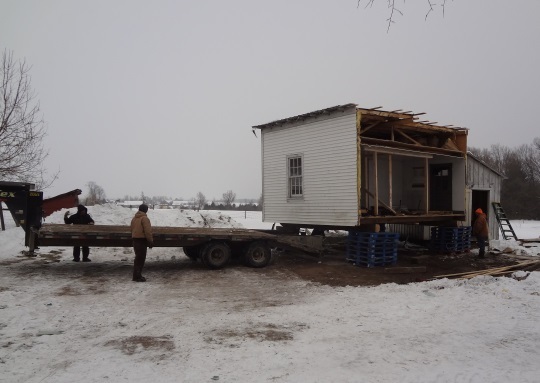 Karen Johnson-Weiner explains below, complete with photos of a skid house being loaded and moved in a Swartzentruber Amish community in upstate New York. 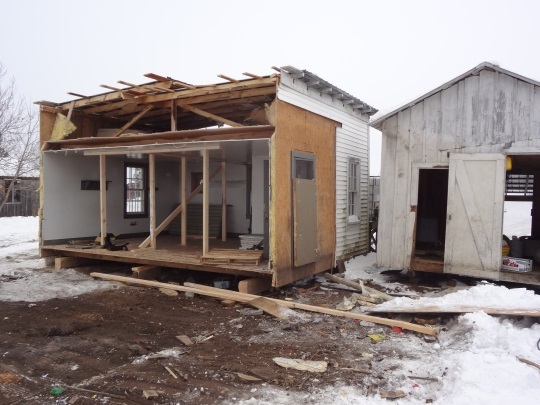 A “skid house” is the equivalent of a mobile home for more conservative Amish. 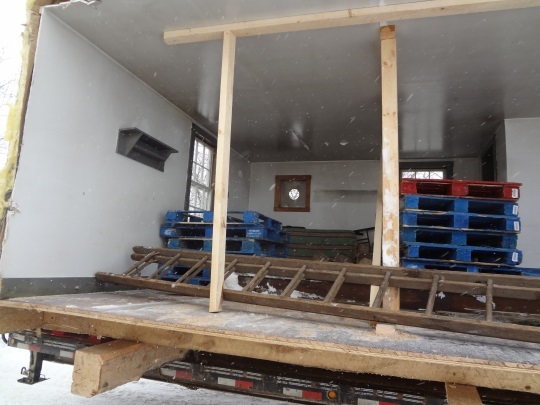 It is built—on wooden skids—so that it can be taken apart and moved. 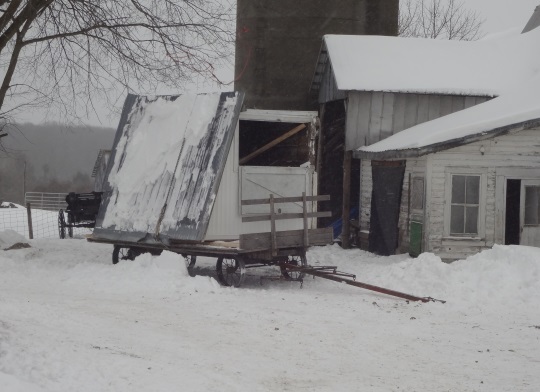 In Swartzentruber Amish communities, for example, a newlywed couple, eager to take up work on a local dairy farm, might build a skid house that they could then move elsewhere, either to a new work site or, ideally, to their own farm. 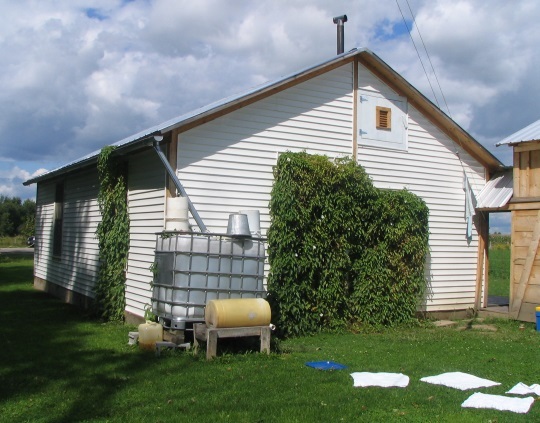 If the couple happens to buy a farm with a house already on it, then the skid house can be sold to some other young couple. One day I was visiting an Amish woman I’ve known since she was a young girl. “Can you come out on Saturday and bring your camera?” she asked. The request itself was not as strange as it might sound. I’m often asked to photograph a new barn roof or a new colt; my Amish friends like having the pictures, as long as I am careful not to take photos of them or their family members. I wanted to know the occasion, however. 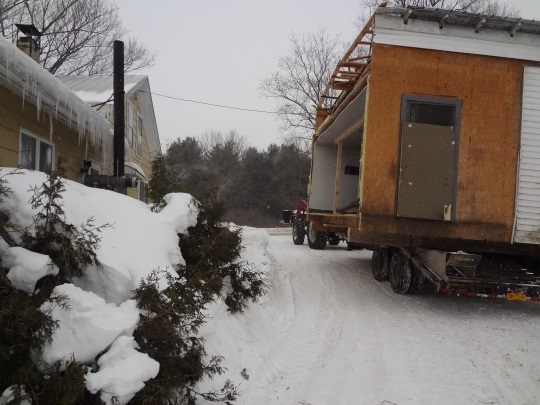 “We’ve sold the skid house, and the truck is coming to move it Saturday,” she said. This was an event! That skid house had been in her family for many years. 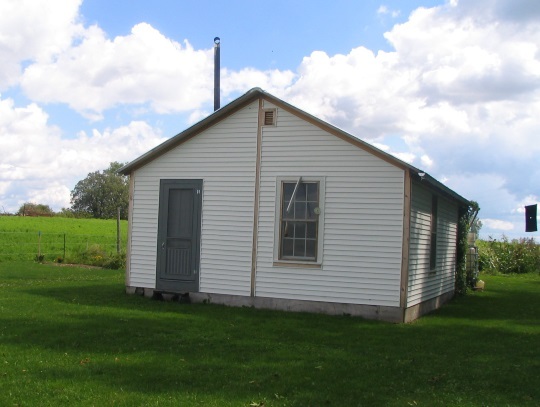 It had originally been built by a reclusive Amish man, who had gotten permission to live on the family property. The man was one of those who move from community to community in search of the best church. 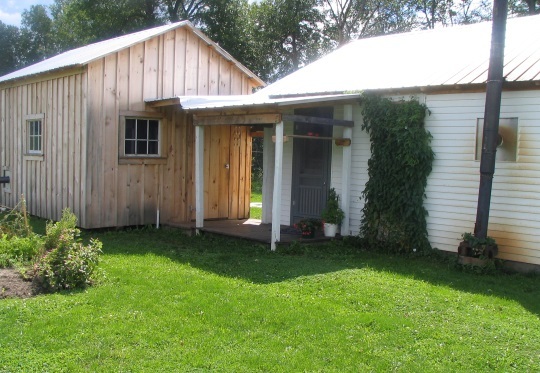 He didn’t stay with the Swartzentrubers long, and, after he had left, the skid house became a “dawdy” or “grandparents’” house, the new home of my friend’s grandmother. 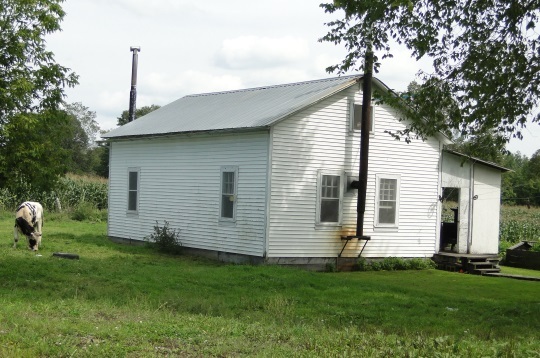 Several years later, following the death of the grandmother and the marriage of my friend, the skid house became the first home of the newlyweds, who moved it to a corner of the bride’s family property, where there was room to set up the wash house and have a small garden. The new husband went to work for his father-in-law, an arrangement that lasted several years until the parents moved to a new settlement in Maine and the young couple bought a farm from a woman in her 90s. 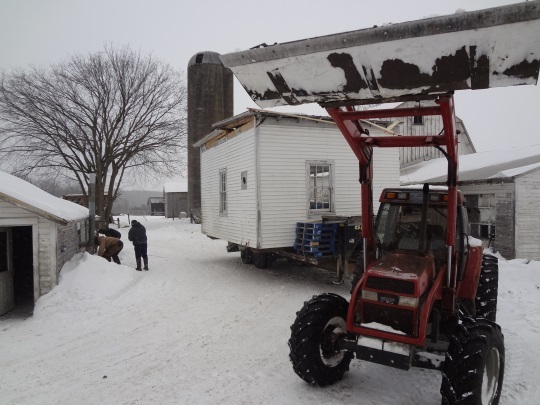 They moved the skid house to their new property, anticipating that they’d soon be in the farm house—to which they’d guaranteed the elderly woman life occupancy. 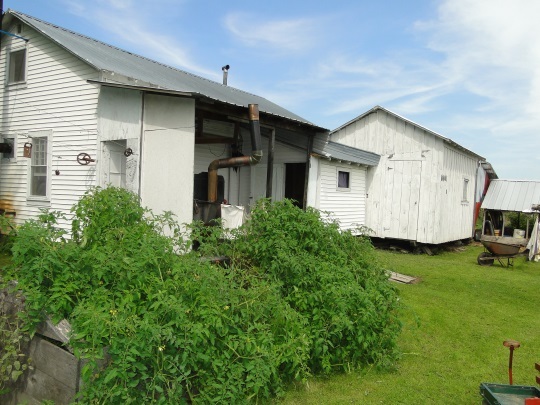 This past fall—seven years and five children after they’d bought the place and shortly after the old woman’s death at 102, they moved into the farm house, and the skid house was vacant. It had been sold to a newlywed couple, whose responsibility it was to move it; the groom arrived with his father, brothers and others, including the English driver and two other English helpers. 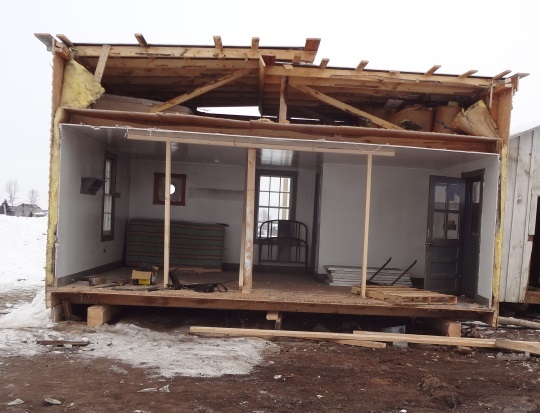 Because the reclusive Amish man who built it had constructed it all in one piece, the new owners first had to saw it in half. This was a job for English helpers because the Swartzentrubers don’t use chain saws. I missed the sawing; in fact, I missed the move of the first half of the house, which was over and done with by the time I arrived at 10: 30. “Come back in an hour or so,” said my friend, which I did. It was cold, with temperatures in the teens and a brisk wind. I watched as three men took turns jacking up first one side and then the other. After jacking up a side a few inches, others inserted a pallet under each corner. 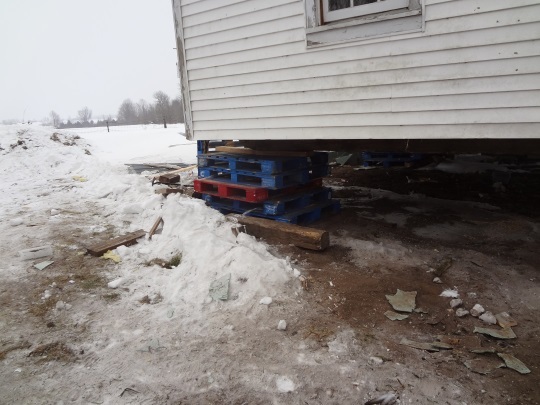 The waiting trailer was about 4 feet high, so the house—or, more properly, the skids underneath the foundation of the house— had to be jacked up to at least 4 feet 2 inches. Once it was high enough, the driver backed the trailer underneath. 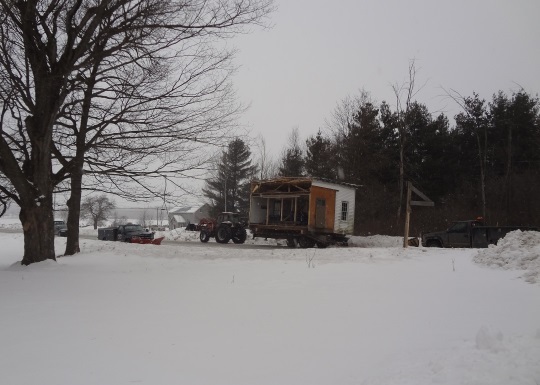 Finally, the structure was lashed down, and the truck slowly moved away. The driver didn’t take the most direct route, which would have taken him through the little village of Heuvelton. That might have attracted too much attention from the local police. Instead, he headed off on back roads. The little wash house, detached and off to the side, was just tipped over onto a waiting flatbed trailer. A team of horses took it to the new site. By Monday the house was together again, home to a new couple. I guess my little house in Florida could be called a Skit House, except it has wheels like a travel camper. I’ve often taken photos at Swartzentruber homes, both when they’ve asked me and when I’ve asked them. I’m careful to reassure them that they will not be in the photo. In the old days of film cameras, everyone would leave the room. Nowadays, thanks to the wonders of digital photography, everyone has to see the pictures as soon as I’ve taken them. I supplied multiple copies of these photos to my friends so that they could send them to family in Maine–and the new skid house owners wanted copies too! FYI, along with copies of the skid house, I also took photos of the family dog, the team of horses, and the rope swing, all at the request of the children. They got copies of those. This is really interesting. Thanks for sharing. Alwats something new to read and learn about the Amish. 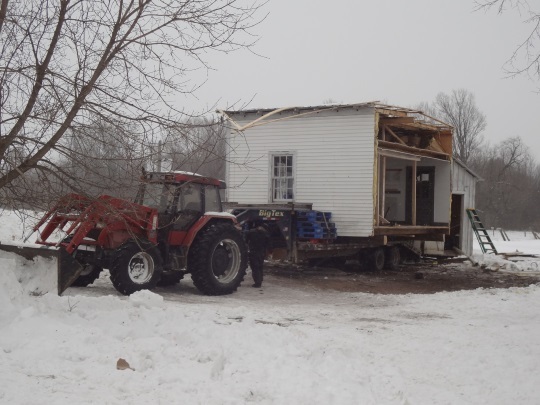 I know of buildings being moved (just a few years ago, a one room schoolhouse in a nearby town was moved across the road to a park), but cutting this one in half was surprising. I’d have liked to have seen the whole house being re-connected. Thanks for sharing. I really enjoyed. I would like to have seen them putting it back together and how they redid the inside where cut. Wow, that’s really neat. Not much different from what we do to elevate structures in coastal flood plains. They use pallets; we use cribbing. It looks like the folded the roof down so that one side overlapped the other along (what should be) the roof ridge. Was the house designed to do that? What happened to the gable end? Wonderful pictures and story! Thanks for sharing. I read my son Mark this posting. 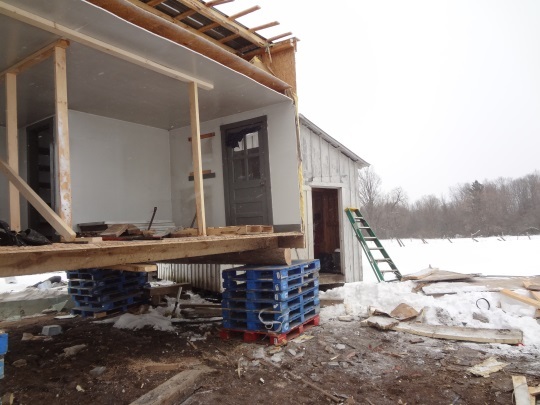 He told me that another reason that some Amish favor skid buildings is that because they are on skids and not on foundations many of the building codes do not apply. Also, real estate property taxes do not apply. There are size restrictions on the buildings, though. Mark was not sure about all of this. Maybe somebody else knows a little more. a beer for the alcoholic? I can’t believe you didn’t quote any Bible verses. Without a single citation from holy writ I cannot believe what you wrote. Everything must be supported with chapter and verse. Preferably from the original 8th edition KJV. Jonathon: I am asking questions, not attempting to persuade with scripture references–that is for the Amish or former Amish to perhaps pursue when they respond to my queries. I follow your reasoning. But no one was pictured in this post, as far as I recall. OldKat hit the nail on the head. There is a significant distinction between having one’s photo taken and a picture of general interest, such as moving a house down the road. The Amish enjoy informative books with pictures so it isn’t a matter of outright rejecting photography. But controlling it’s use seems downright impossible so it is universally banned. But there are various shades of opinion in between. I really enjoyed the way you phrased the question. It sounded like someone could make these graven images in a shop. Brightened my day a bit! I am most assuredly NOT an expert on this subject. Hopefully someone that is will weigh in and either support what I am saying OR refute/refine it with more accurate information. Regardless, my understanding is that the traditional Amish concern about photography is that allowing their picture to be taken could become a competitive thing. The issue being that if it were to be competitive, with posing and so forth … it could become a matter of “pride” about how the pictures come out. It is that pride issue that they are most concerned about. That is why some Amish are not concerned if they are in the background of a photograph; especially so if the picture is un-posed and their back is to the camera. If picture is a random, un-posed photo and their image is captured more or less accidentally there was clearly no effort on their part to be photographed, so it was not a “prideful” intent on their part. That would be why photos of say farm animals or products that they are advertising for sale are okay. A family portrait would not. Also, there are probably as many takes on this as there are various groups of Amish … so my understanding, if it really is accurate to any extent at all, is not universal among all Amish people. Thanks OldKat for sharing your understanding of how the Amish might be seeking to avoid prideful activities, such as posing for pictures. Makes sense, but what I am hoping to have someone submit, is perhaps part of a district’s ordung or at least the oral traditions which are quoted by church leaders to oppose either the taking of pictures or posing by Amish or having a human face in the photo. And my underlying issue was, if something is sinful for the Amish, how can they encourage English to do such things? The basic concept is that since drunkenness is a sin, we would not give an alcoholic a six pack of beer and thereby encourage him to become inebriated, likewise if the Amish believe making a picture of themselves is creating an idol or otherwise prohibited by God, why would they want the English to create idols or violate scripture? I think that many Amish would explain it something like: “It is something that we choose not to have, based on the way we live out scriptural principals, but the Bible does not specifically forbid such things.” The Amish choose not to have cars, tv’s, cameras, etc. but they fully understand that just because a non-Amish person has these things, does not mean that they are not saved. You could also possibly apply two kingdoms theology to the situation. For example, I have made the decision to give my life to Jesus in all things, and to obey him to the extent that I can, with the aid of the Holy Spirit. I live in His kingdom. This means that I follow a certain set of rules, and I expect other believers in my church to follow those rules as well. But I do not impose those rules on non-believers, those who belong to “the world.” In fact, I do not judge them at all. How could I? I was once a non-believer. They are not convicted of their sin. Perhaps they have never heard the gospel. They don’t have the Holy Spirit working on them from the inside. Why should I expect them to be convicted that posing for pictures is prideful? Or that showing a lot of flesh is immodest? Or that hating a person on the inside is just as bad as persecuting them on the outside? Didn’t one of the Amish people write he has photo ID? If they thought it was a sin, they would not do that. I drive for Amish people and know that many around here don’t really like their picture taken, but I have never heard anyone claim it is a spiritual issue. One lady told me she does not want to pose but if I take her picture discreetly she’s okay with it, but she really does not want to end up in someone’s scrapbook or on a post-card. I haven’t asked Mark about this so I’ll just give my two cents worth. There is a difference between Amish having their photo taken and what you say, Leon, “wanting the English to take their photo.” I don’t think many Amish want or desire the English to take any photos. That is up to the English person. I have never had an Amish person begging me or hoping that I will take their photo. Mark has told me that in their community’s ordnung it is not allowed to pose for photos. If somebody snaps Mark’s photo while he is out and about he is not going to wrestle them down to get their camera. He didn’t pose for the photo and that’s okay with his community. As far as photo id’s. There are some individuals in his community that refuse to do that. There are others that have had their photo taken. Mark’s community allows photos to be taken for legal reasons, only. Not all Amish communities would allow this. That is Belle Center’s line. 19 And lest thou lift up thine eyes unto heaven, and when thou seest the sun, and the moon, and the stars, even all the host of heaven, shouldest be driven to worship them, and serve them, which the LORD thy God hath divided unto all nations under the whole heaven.” Are there any Amish that teach this as the reason for not making or taking photos? Likewise, the Schwartz (Swiss) amish in Mo. and Ind. do not put faces on dolls, it might be a graven image. There are a broad range of views. The view traditionally ascribed to the Amish is that making an image (whether a picture, statue, or other replication, such as a doll) constitutes making a ‘graven image.’ This view is likely found among the most traditional groups, such as the Seymour (MO) Swiss Amish and Swartzentruber Amish. But many believe this reasoning is unsound, either because a ‘graven image’ is synonymous with an idol used in pagan worship and thus does not apply to photographs or because the application is altogether too broad. For example, some Amish would question whether the face of a doll counts because it does not replicate the image of a human being or living animal. However, some Amish feel any use of the second commandment is entirely mistaken. Instead of appealing to the ban on graven images they provide different rationale for rejecting photography. Pride is usually toward the top of this list. And the inability of church leaders to control its use would probably also be found there. So different reasoning leads to drawing different lines, as previous comments have clearly shown. And since communities have varying conceptions of what it means to be ‘worldly’ they follow different standards. And if I may extend Naomi’s comment, just because the Amish have a particular rule about something, it doesn’t mean that what is forbidden is necessarily sinful. They tend to think that a high-tech picture culture will be a detriment to themselves and especially their youth. So the easiest solution is to forbid cameras and instead ask a neighbor to take a few pictures when there is a good reason for this. It is not asking them to do something sinful so much as asking them for a favor because they do not have the resources to get that picture snapped. Thanks, Jonathan Edwards, for your summary above. To me the reason behind the Amish lifestyle is more important than their way of living, since I am the kind of person who must have a reason for everything I do or don’t do. Which is why it helps to have these discussions, hopefully with some real, live, Amish submitting comments, as well as those of us who have lived with or among them. You’re welcome. I also want to have a solid reason for everything I do, or don’t do. So I guess we have this in common. Do you know if the house was also halved for its first move, or was the move a shorter distance? 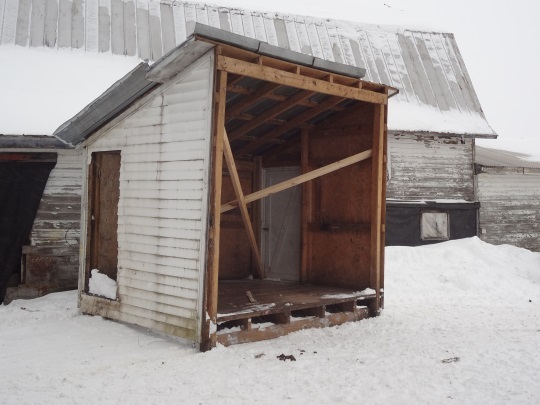 Most mini-barns are also built on skids.